Holds Folded Mic Stands Up to 24"
The Auray MS-GIGBAG is a soft, weather-resistant carrying case for the Travelers Mic Stand and its corresponding boom arm, the MS-GIGBOOM. You'll find it easily fits mic stands and boom arms that measure up to 24", as well as room for a couple of cables. The case is designed to protect your stand and boom from dings and scratches. The weather-resistant nylon exterior is designed to keep your equipment dry if you get caught in inclement weather. Two handles provide a secure and comfortable grip. Hopping from studio to stage can take a toll on your equipment. 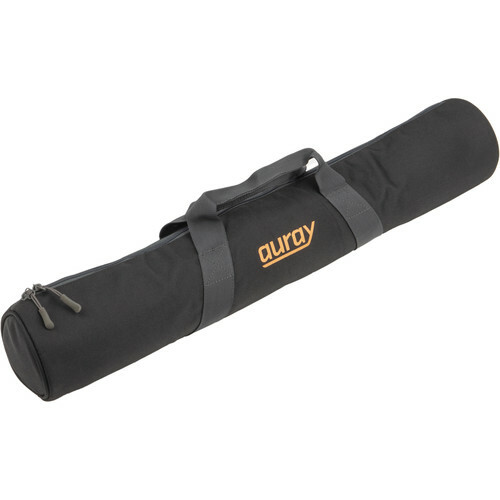 The Auray MS-GIGBAG offers a weather-resistant nylon exterior. So if you get stuck in bad weather, your contents will stay dry. The MS-GIGBAG offers two comfortable grip handles to facilitate and ease transportation. Its nylon straps are folded and feel soft, so you won't lose your grip even in wet conditions. Box Dimensions (LxWxH) 11.0 x 7.0 x 4.0"
MS-GIGBAG Carry Bag for Travelers Mic Stand & MS-GIGBOOM Boom Arm is rated 5.0 out of 5 by 1. Rated 5 out of 5 by Shawn from Get the bag! Great quality carry bag for my Auray traveling mic stand and boom arm. Two handles, padded, smooth-functioning zipper. My kit is clean and safe so Im happy!